Who needs roads when you scale walls and the like? 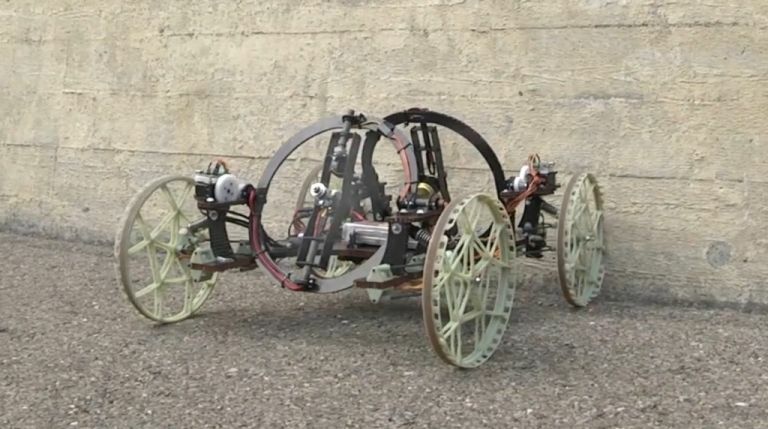 Created in conjunction with Disney Research and ETH Zurich, the VertiGo robot that can not only traverse difficult or treacherous surfaces but also mount and drive across walls just as easily thanks to a pair of tilting propellers. And while those two propellers don't transform this mini vehicle into a drone, but they do produce enough thrust to either keep it affixed to a wall while moving or flip from a horizontal position straight into a vertical one. With a set of four adjustable wheels, the VertiGo could, in theory, adapt to to varying environments and conditions - making it ideal for rescue efforts in dangerous locales or as recon units out in the field. For the teams at Disney Research and ETH Zurich, making the VertiGo work all came down to maximizing the ratio between thrust output and vehicle weight. By using super-light materials such as 3D-printed wheels and carbon-fibre baseplate, those working on the project were able to craft a robot that was light enough to maintain traction on vertical surfaces without sending it crashing down again.